The motorcycle community connects people in a way like no other. When you roll up to bike night or your favorite mountain-road turnoff, everyone embraces you like family. Immediately you talk and laugh with these people like lifelong friends, without ever having even exchanged names. They want to know about your bike, about what you’ve put on it, what settings you’re running, where you’re coming from, and where you’re going. What you do for a living or how much money you make doesn’t matter; there are no social barriers in this community. It’s a shared passion for the life lived on two wheels that brings people together and forms a deep sense of camaraderie. But where does that camaraderie come from? The relationships that serve as the glue of the community are born from the experience of what it feels like to be riding a motorcycle. Riding gives one a heightened awareness unique to just about anything else in the world. It’s a peace, a dharma of sorts; it helps you take a step back and turn down the volume on all the noise going on in your life, a blissful escape to a world where nothing matters but man and machine. It’s no wonder, then, that there’s such a tight-knit community that grew around motorcycles and the motorcycle lifestyle. But it’s a funny thing, because motorcycles originally came from a simple utilitarian need: transportation. The first motorcycle was created in 1885 by German inventors Gottlieb Daimler and Wilhelm Maybach (who would later go on to merge with Karl Benz to create the company that would eventually become Mercedes-Benz) to serve as a test bed for an early car engine. In the years following, manufacturers like Triumph, Indian, Harley-Davidson, and numerous others were inspired by these designs and created their own. They all recognized that motorcycles were a considerably less expensive form of transportation than automobiles, and that an adventure-seeker lifestyle was quickly forming around them. The outbreak of World War I kicked motorcycle production into overdrive, though, when they were heavily used by the military to transport messages through a trench-laced Europe. With tens of thousands of units being produced worldwide, and motorcycles such as Triumph’s Model H having earned the title of “The Trusty Triumph,” motorcycles became accepted and even embraced throughout the world as a practical form of transportation. Since then, in the Western world, motorcycles have largely been sectioned off as a form of entertainment, effectively speaking. They’re used for racing, stunting, being shown off, or as lifestyle symbols of the freedom-loving spirit. In the Eastern world, they’re the most common form of transportation, and for good reason. The Honda Super Cub sold its 60 millionth unit in 2008, and the Hero Splendor has recently sold its 8.5 millionth. This is because they can be modified easily to cross over any kind of terrain, are not prohibitively expensive to purchase, and are affordable to both use and maintain. Motorcycles can be used to do more than just transport people, though. And I’m not talking about pizza. In the late 1980s, Barry and Andrea Coleman, a pair of humanitarians and philanthropists, were appalled by the fact that the tens of millions of people living in sub-Saharan Africa could not receive any form of health care because they were widely considered “too hard to reach.” The Colemans were compelled to find a solution so that all those families wouldn’t have to live in desperation. The answer they found? Motorcycles. Thus was born the charity now known as Riders for Health. 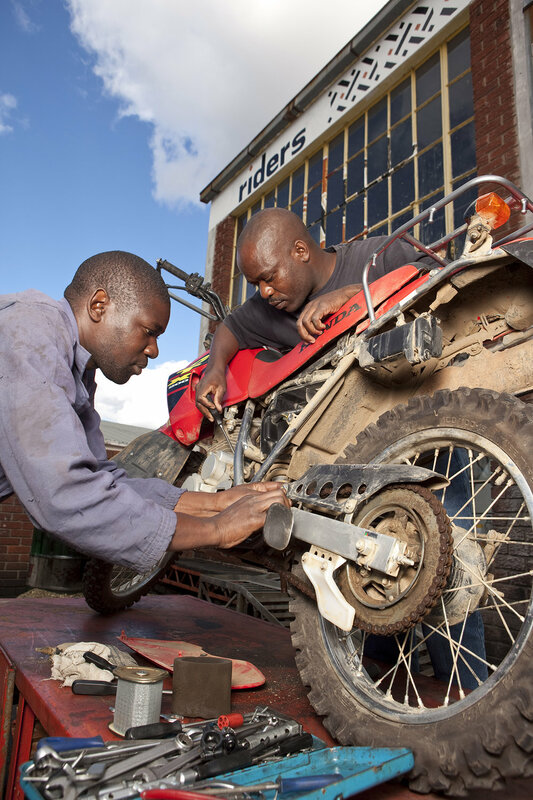 Nearly 30 years later, Riders for Health has 115 technicians servicing 25 garages’ worth of vehicles, and has health workers traveling nearly 1,400 kilometers per month delivering lifesaving medical supplies and services to some of the most remote communities in Africa. They primarily use Yamaha AG200Fs and AG100s, which are renowned for having near-bulletproof reliability and toughness. What’s so unique about Riders for Health is that they’re able to use something we’re very passionate about literally to save lives , literally. And they’re doing so in a highly effective and efficient way. In many cases, a charity that directs 75 percent of all donations received toward its cause is considered a worthy one. Riders for Health commits 84 percent of all donations to their efforts. A simple motorcycle, like the ones used by Riders for Health, is inexpensive to maintain and use. 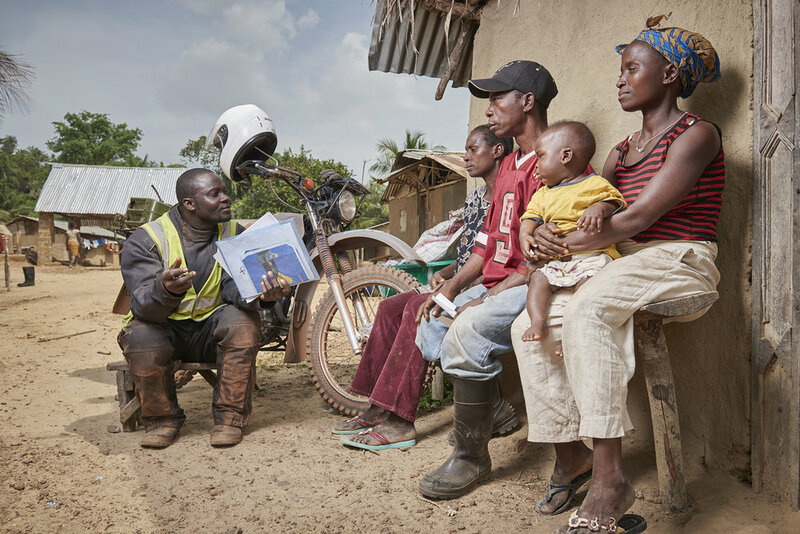 Therefore, a small amount of money donated to Riders for Health can go very far: $3 can buy a spark plug, $10 a tank of fuel, $100 can train a health worker to ride and maintain a motorcycle, and $1,000 can keep a health worker delivering supplies and services to communities in need for a whole year. 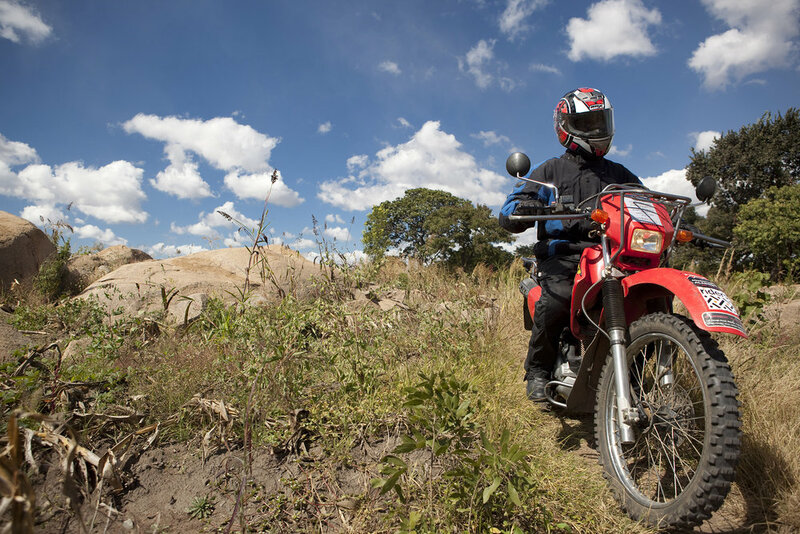 For Riders for Health, a tank of fuel means that desperate families can receive the care and medical supplies they need to survive. A new spark plug means a bike won’t break down while getting across a flooded trail or a long sand wash and prevent parents and their children from receiving vital health care. A health worker who can receive the funding necessary to stay on the road for a year means that many more communities can be touched and helped more regularly, and thus more lives saved. Charities like Riders for Health subsist on the generosity of donations, and the best way to champion a charity’s cause is to mobilize one community willing to aid another. Riders recently connected with British Customs, a lifestyle brand and designer of aftermarket motorcycle parts, to help raise awareness in aid of their efforts. British Customs then put together a team of sponsors including GoPro, Nixon, Simpson Race Products, Stance, and others to support Riders for Health. Chippa Wilson, professional surfer and lifestyle icon, will be carrying the torch as the team’s ambassador. This team’s mission is to raise as much as possible for Riders for Health, because they’ve put things in perspective and they know that the efforts of groups like Riders for Health are what’s important. Besides helping to raise awareness for Riders for Health globally, they’re contributing things that can be put to use in the same way that Riders for Health put motorcycles to use. Stance is donating 400 pairs of socks to the organization. GoPro is donating cameras to help them document their efforts. 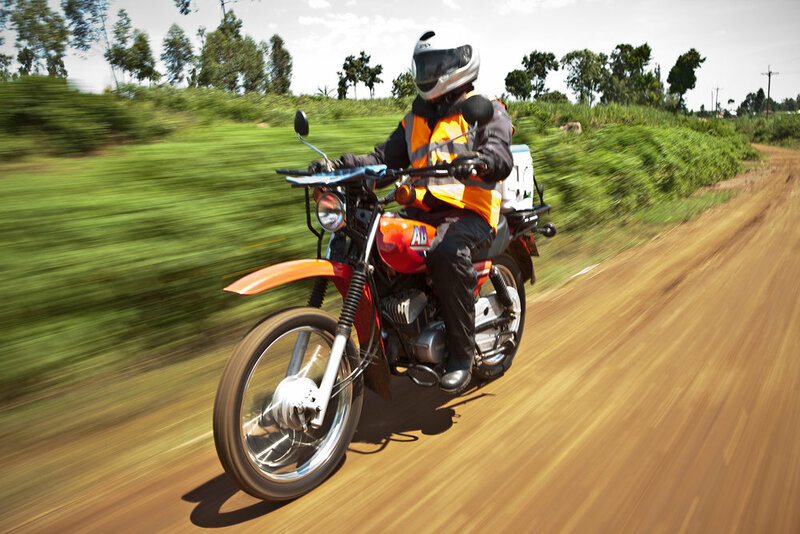 Wilson will be going to Africa himself with members of the team as part of Riders Experience Africa, an opportunity Riders for Health offers for anyone to get on the same motorcycles used by the organization’s health workers and deliver medical supplies alongside them. 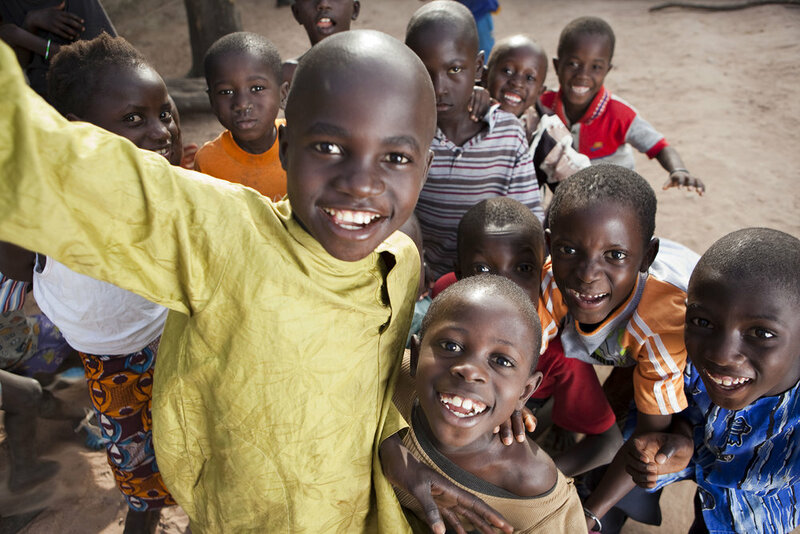 Giving back is what makes the world a better place. It’s so easy nowadays to get completely absorbed in your own life. It’s what today’s culture of mass materialist consumption encourages. But it’s critical to not forget that we’re all part of a greater community of human beings who need to look out for each other. We are all our brothers’ keepers, because if we aren’t, then no one is.